The Creative Studios Project was designed to develop Aberystwyth Arts Centre's role as a creative hub for arts businesses, arts development agencies, artists and craft workers. The mix of artists and arts businesses is a unique feature of this development with both new and established occupants interacting together in a stimulating environment to realise their economic and creative potential. 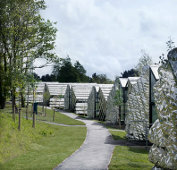 The Creative Studios Project, designed by Heatherwick Studio, worth £1.4 million, has been made possible by support from Aberystwyth University, the Arts Council of Wales Lottery Fund and the Welsh Assembly Government. 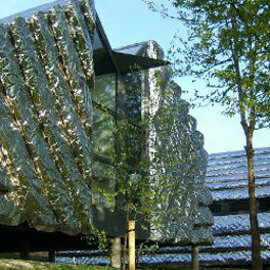 The Creative Units were one of only 18 buildings in the UK and Ireland to receive a 2011 Civic Trust Award and the only building to be chosen from Wales. The Creative Units have also been awarded a RIBA Award for buildings that have high architectural standards and make a substantial contribution to the local environment. Aberystwyth Arts Centre Residencies offer artists a period for research and development of their work.